Hybrid vs Native: what to choose for app development? The apparent increase in the number of users of mobile devices invariably entails a rapid development of the mobile applications market. It's no surprise that business owners also want to become "more flexible". If a person has already made a resolution on the need to create a mobile application, one of the following steps is to decide which type of application to choose. Will this be a native application? Or is it better to choose a web application? 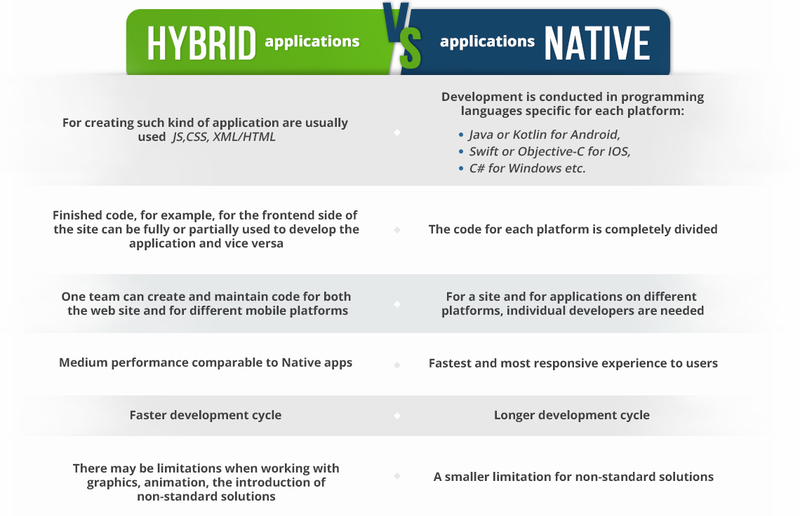 Let's see a differences between native and hybrid applications in the context of web development. Results: choosing a hybrid development, you get time and money saving for developing and supporting the application, if there is already a site working as a modern web application ( REST API on server side and React or Angular Framework on client side ), in this case, you can use existing code for faster app creation. Also, if you plan to simultaneously develop a site and apps for your business or startup, you can pick up a stack of technologies that allows you to combine and accelerate development within a single team. Or you just want to save time and resources for faster and more economical application launch for all popular smartphone operating systems, then it's worth considering the option of creating a hybrid application, because of the easy adaptation for different devices. The disadvantages of the same hybrid development can be the less rapid responsiveness and speed of the application that will depend on the resources of the user's device, it is also sometimes possible to encounter constraints if you want to implement non-standard functionality. The choice of hybrid development technologies is currently considerable, its solutions are offered by: Ionic, React Native, NativeScript, Xamarin, PhoneGap etc. 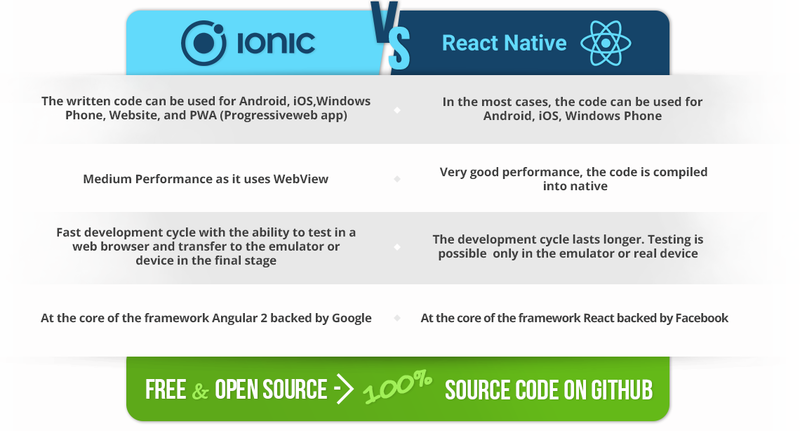 In this article, we'll look at two of the most popular frameworks: Ionic and React Native. These frameworks have earned developers loyalty, as evidenced by the large number of stars on GitHub. A large number of applications have been already implemented on these technologies. Here is a small comparison table. Results: React Native gives a very good performance close to native applications. At the same time, Ionic gives us the best portability of code on different platforms and a faster development cycle. Ionic based app can be created and maintained by Angular 2 frontend developer, React Native based app can be created and maintained by React frontend developer. Are you still hesitating about mobile app for your business? Contact us and we will answer all your questions.